On Amazon Prime Day this summer I bought an Amazon Echo Dot. I had recently spent some time playing around with an Echo at a friend’s house and I quickly fell in love with it. It’s a completely unnecessary piece of technology, but it helps my laziness you quickly and easily solve a few different tasks in the classroom. The Amazon Echo has stronger speakers than the Dot but the Dot functions just fine in my classroom- though know the Echo itself might give you a stronger volume. You can also connect the Dot to external speakers using Bluetooth, so that’s always an option as well. The Dot is pretty affordable too, especially if you pick it up on Prime Day or during a Black Friday deal, making it a relatively easy classroom splurge. While those deals are gone for the year, I’m guessing Amazon will have them on sale again this month. Once you get your Dot in the mail, you have to set it up with your wi-fi and set up your account. It’s pretty quick and simple. I chose to set mine up using the Amazon account I already set up for school with my Kindle apps. I customized the location so my Echo Dot is based where I work since it stays in my classroom, and not my home zip code. You are able to go into the Alexa app, or the web based site, to change your settings and learn new features at any time. You can even change the wake up work from “Alexa” to “Echo” or one of three other preset choices. It’s important to note if you’re not familiar, the Echo is the name of the device itself whereas “Alexa” is the name of the AI software you’re asking for help. Alexa is to Amazon Echo the way Siri is to the iPhone. You will want to establish clear and consistent procedures for using your Echo in the classroom. Mine sits on the space behind my desk, and students are not allowed to use it without permission. The device itself is never handled by students. Here are some of the ways I’ve already used Alexa in the classroom, and some new ideas as well. We do calendar as part of our morning routine each day. The bulk of the work is done by the Student of the Day, and their favorite part is coming over to my desk to ask Alexa for today’s weather forecast. They record it on our thermometer and graph the weather. Previously, we listened for it during our daily announcements (and often missed it) or I wanted to weather.com to look it up. This makes it much more simple for me, and even better, the kids absolutely love it because they get to ask Alexa. When we do calendar, we also work through our Number of the Day. We can get quite wrapped up into it, so an easy way for us to stay on track is to set a timer for 10 minutes. From the easel, I just call for Alexa to set a timer for 10 minutes. At the end, the timer goes off until told to stop with “Alexa, stop”. Alexa does not have a specific sound or other indicator to signal exactly when the timer begins (she does say “10 minute timer, starting now”) so I do not use this if students need to be timed for something precise. Alexa has a random number picker. You just give her the range needed and she’ll choose a number. I like using Alexa for this because my students can see and hear that it’s not my choosing. I haven’t used this feature yet, but you can use Alexa to roll a dice to choose a number between 1 and 6. You can use this to group students, as part of a math game or centers, to find numbers to use to practice facts, etc. Sometimes there are words that stump us. Sometimes there are words that we struggle to spell despite trying over and over again. Sometimes we want to show our students that teachers aren’t perfect and don’t know everything. Here comes Alexa to problem solve for us. A few weeks ago, we were writing silly animal sentences to be the inspiration behind some silly animal stories. One of my students wanted “hippopotamus” as the animal in their sentence. I loved that they went beyond the cat and dog, but I can’t tell you that I’ve ever needed to write “hippopotamus” in my life, and if I did, I’m sure I wrote it as “hippo”. Alexa to the rescue! I was able to call to her for the spelling and never had to leave my spot at the carpet and easel with my students. I’m terrible at remembering things throughout the day- just ask my students. They’re constantly reminding me of things, or trying to remind me of things they think I’ve forgotten. I tell students things to remind me, I give them messages as soon as I get them and make them responsible for remembering (that’s probably not the best or safest method). Now, I just tell Alexa and ask her to remind me at a specific time- usually right before we pack up for dismissal. This way, I don’t have to remember, I don’t have to rely on students, and we both get the reminder we need. Quick and easy (because I never check that dry erase board next to the door that was placed there exactly for these reminders). This is one I haven’t tried out myself yet, but I’m going to start doing it next week. I have two students who recently qualified for pull out special ed services and their times aren’t always the same. That coupled with pull out intervention services means there’s times when kids are coming and going non-stop. I’ve been using the alarms on my phone, and it’s super helpful, but then I need to be near my cell phone to turn the alarm off. One day I was in a meeting and my alarms were going off and the sub coverage didn’t feel comfortable turning off the alarm. I cannot imagine how long it kept going off (and snoozing and going off again). The one thing I’m not positive of as of yet is that it doesn’t appear that I can change the sound on the alarms to be specific to each one- which is a great feature on my phone because students know which sound is their alarm. Alarms must be set up on the device itself, but the settings can be accessed on the web or in the app. (Amazon, if you read this, please allow us to give different alarms different sounds!) You can set alarms to be repeating, set for specific days of the week, or to be weekend or weekday alarms. 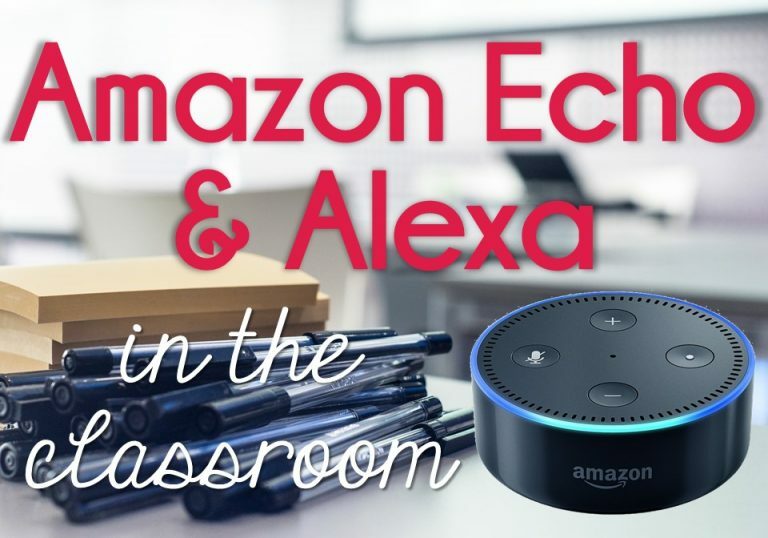 There are so many fun features with Alexa, and while many of them are not relevant or appropriate for the classroom, many could be used as a reward with students or with just a bit of fun. On Halloween, we asked Alexa for several Halloween jokes. You can ask her what her favorite movie is, or who sings a specific song. You can even ask her to sing a song herself. There are loads of “skills” that can be connected with Alexa and you can play things like Jeopardy or 20 Questions. (Note- Links in this post are affiliated links. I receive a small commission from purchases at no cost to you).